The kidnappers, who disguised as new church members, had around 7am on Sunday come into the church. The gunmen, after sighting the pastor, reportedly brought out weapons and ordered him to come with them, after which they disappeared into the creek. There was confusion thereafter at the parish, which made the Sunday service to end abruptly. One of the witnesses had said the gunmen, believed to be Ijaw militants, came into the church with bibles, and met the pastor and four other members. One of the family friends, who did not want her name in print, said the gunmen had demanded a ransom of N100m. “Those men have called. They are asking for N100m. That is a big worry. The pastor was cleaning the chairs on Sunday with a few members when the men came in. But God is in control,” she said. A police source confirm that operatives had visited the church. 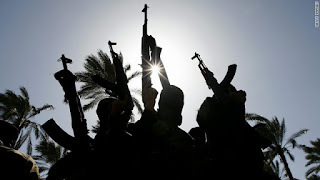 It was learnt that last week in the area, gunmen abducted a hotelier and demanded N10m which the victim’s family had yet to pay. A resident, who gave his name only as Jacob, said 13-year-old twin brothers were also abducted by gunmen in the area when the plot to abduct their father failed. He said, “An immigration officer was kidnapped in our area. After the officer was released, they picked him again. They also picked a hotelier. The hotelier has not been released because his family members have yet to pay the N10m ransom the abductors demanded. “On another occasion, they abducted twin brothers. The twins’ father was the target of the hoodlums because he worked in a big company in the Somolu area of Lagos. But since he was not at home, they abducted his 13-year-old twins. That was last Monday. They were, however, released on Wednesday after the man paid N20,000. The Lagos State Police Public Relations Officer, SP Dolapo Badmos, said the Commissioner of Police, Fatai Owoseni, had ordered the transfer of the case to SARS. “The CP has directed that the case be transferred to SARS to give it the attention it deserves,” she said.